Teeth grinding and clenching are common habits, but that doesn't mean they are harmless. Stresses from the powerful forces generated by clenching and grinding (also known as “bruxing”) can wear down teeth or even loosen them. Teeth that have enamel worn away or scraped off from this repeated rubbing action may become sensitive to hot or cold. And dental work such as crowns and fillings may get damaged. Bruxism can also lead to jaw pain and/or headaches. Even if you have experienced some of these signs and symptoms, you may not realize you are a bruxer — particularly if your habit is nocturnal, as is often the case. Yet the evidence of tooth damage may become obvious to us when you come in for your regular checkup and cleaning. Should we notice this, we will certainly let you know. We will also try to help you break the habit, relieve any pain you are experiencing, and repair any damage to your teeth or dental work. Sometimes simply becoming aware of the habit can help you to get it under control. If stress is the issue, try to find healthy ways of managing it: exercise, meditation, listening to relaxing music, or a warm bath may help. We will monitor your teeth over time to see if the problem is getting better or worsening. 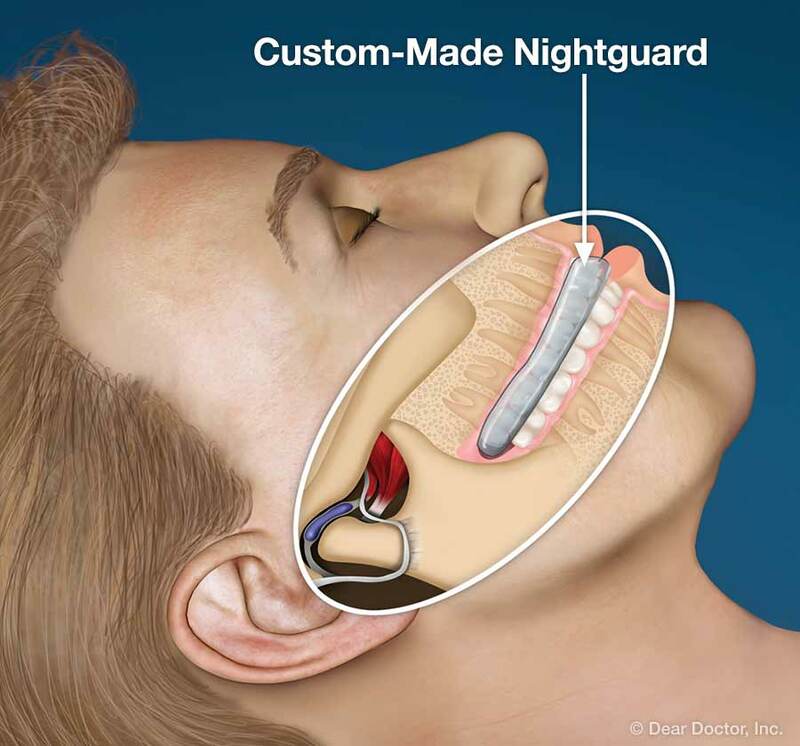 If damage to your teeth or existing dental work is evident, we may recommend a custom-made nightguard, also known as an “occlusal guard,” which is a device that resembles an athletic mouthguard. Made of comfortable plastic, the guard is worn at night to keep your teeth from actually contacting each other. It also helps protect your jaw joints from excessive force. If a bite problem exists where some teeth are hitting before the others (all of your teeth should hit at the same time), we may treat it by removing a tiny bit of enamel from an individual tooth that is sticking up a bit (and therefore receiving too much force) to bring it in line with the others. This is known as a bite adjustment. If your malocclusion (bad bite) is more serious, orthodontics might be recommended. 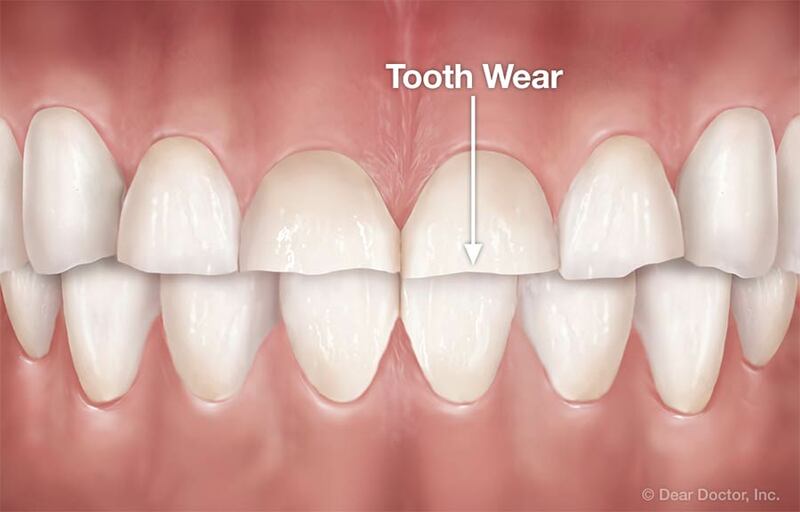 Replacing any teeth that are missing can also help stabilize your bite by inhibiting the shifting of teeth that occurs when extra space is left open by missing teeth. A word about kids: Teeth grinding is very common in children, especially when they are shedding their baby teeth. Since they often outgrow it, treatment is not usually recommended. Please let us know if you have any questions about the effects of grinding on your child's teeth or on your own.